Warning: major spoilers ahead for Episode 17 of Season 4 of Arrow. Season 4 of Arrow has had a lot going on. Now that the result of pre-island Oliver pollinating an ill-advised flower has been dealt with and the falling action of the Olicity breakup has bee-n completed, the show is back on track and sweet as honey as it heads toward that gravely serious flashforward from the season premiere. Somebody on Team Arrow will soon run out of the sweet nectar of life and buzz off to that great honeycomb in the sky. Luckily, "Beacon of Hope” was positively swarming with hints about who could take the place of whoever loses their stinger too soon and ends up in the grave. Now that I’ve exhausted my supply of bee puns, I’ll get into why none other than Curtis Holt is likely to soon become much more involved with Team Arrow. Curtis, the future Mr. Terrific, has been skirting the big secret of Team Arrow from the moment he discovered that Felicity was the tech support, and “Beacon of Hope” finally brought him into the fold of folks who know the truth. He has discovered that Oliver is the Green Arrow, Laurel is the Black Canary, Diggle is Spartan, and Quentin is an accessory. Unless Arrow throws a real curveball with the big death by killing off Season 4 newbie Curtis, it's surely no coincidence that he was brought in to the Arrow bunker in the episode before the mystery death. Now, if a flashforward hadn’t already revealed that Felicity is very much alive following the funeral, Curtis’ introduction to Team Arrow would have been very worrisome for her future. He may have fumbled here and there, but he did a pretty smooth job of filling in for Felicity on the tech front. 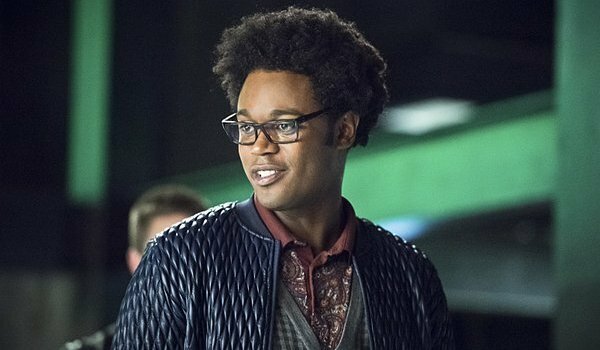 Short of Arrow really seriously copping out and revealing that the flashforward Felicity was a hallucination, we don’t have to be too concerned that Curtis’ computer skills are what will make him an essential part of taking down the bad guys remaining in Season 4 and possibly beyond. Curtis has spent most of his time on screen showing off his intellect, but Arrow has gone out of the way to establish that Curtis is actually quite the athlete when he’s not inventing biostimulants to cure paralysis. “Beacon of Hope” was the first episode that really demonstrated Curtis in action in a physical, rather than mental, capacity. Sure, he was mostly running around the bunker and leaping over debris to escape one of Brie Larvan's bees, but the athleticism was very much present. Given that Curtis dropped a “terrific” in the very same episode that highlighted his abilities as both an engineer and an athlete, we can safely say that he’s well on his way to becoming Mr. Terrific in live-action. As Mr. Terrific, Curtis would have the abilities to somewhat replace the Team Arrow member who is neither Oliver nor Felicity. He wouldn’t have the sheer bulk of Spartan, the speed of Speedy, or the buckles of Black Canary, but he’d bring enough of a unique skillset to fill the talent gap well enough for the good guys to beat the bad guys. His reluctance to join the crusade after the events of “Beacon of Hope” almost certainly means that Curtis would be more an auxiliary member of the team than a full-fledged contributor, but this latest episode proved pretty conclusively that Curtis has solid instincts to help fight crime. Besides, there’s nothing like a tragic death to motivate a person to become a different kind of hero. Oliver does it pretty much every season. On the whole, Team Arrow may be losing a member in the very near future, but it’s also probably going to get a whole lot more Terrific for the final run of episodes this season. I wouldn't bet on him being a main player on the team in Season 5, but the stage has been set for him to rise up in the rest of Season 4.